ROCHESTER, N.Y. — Dylan Clark (Milton District/Milton, ON) allowed two runs on four hits in a complete-game effort, and the Monroe Community College baseball team swept Erie Community College (15-3/8-2) in NJCAA action at Tribune Field, Saturday. Clark struck out eight, walked none and improved to 2-1 with his longest outing of the season. The sophomore right-hander allowed two runs on a pair of one-out doubles and a hit batsman in the first inning. He retired 20 of the next 22 batters he faced including 12 straight from the end of the third inning until surrendering a two-out base hit in the seventh frame. 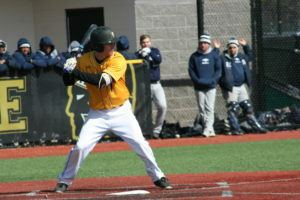 Clark’s previous longest outing was a six-inning effort in an 8-4 win over Northampton Community College on April 6th. He has now thrown 18 innings this season. Evan Magill (Notre Dame Catholic/Ajax, ON) finished 3-for-4 in the game. Magill got Monroe on the scoreboard in the second inning with a solo shot to left center. He gave Monroe a lead it did not surrender when he plated Sam Loew (Binghamton) with a two-out RBI base hit in the third inning. Trey Brown (Aquinas) went 2-for-3 with a walk and supplied insurance runs with a two-out single in the fifth that brought home Sean Flannery (Wayne) and Logan Martella-Tasick (Penfield) for the final margin of victory. Martella-Tasick drove in five runs in the opener going 2-for-3 with a double and a home run. Martella-Tasick’s three-run shot in the third inning helped the Tribs stretch their advantage to six at 8-2. One inning later, the sophomore centerfielder drove in two with a double as the Tribunes put the game out of reach at 15-2. Flannery went 4-for-5 in the twin bill with two walks, four runs scored and three RBI. TJ Lucey (Fairport) went 2-for-2 with a double, a walk, two RBI and three runs scored in the first game. Jose Ramos (Poinciana/Kissimmee, FL) with an RBI and two runs scored. Phil Ferranti (Webster Schroeder) was 2-for-4 and scored a run. Nate Hampson (Victor) picked up the win in game one. The freshman left-hander struck out eight, walked one and matched his previous longest outing of the season going five frames. He improved to 2-2. Monroe improved to 18-18 with their first sweep since March 28th. Since then the Tribunes have four DH splits and one instance where they dropped a pair. Monroe travels to play at Erie on Sunday. A 1 PM first pitch is scheduled. The Tribunes next home date is Thursday, April 18th when they host regional foe Mercyhurst NE.